For the longest amount of time I loved flavored coffee. I would buy it whole bean and grind it every morning. Then I got tired of the extra work and started buying ground. This week I realized I now hate flavored coffee. I sat down with my morning cup and thought yuck, I really just wanted a cup of dark roast. It's funny how as we get older foods and drinks that we used to love just don't hold the same appeal. I hated beets growing up. However, a couple of years back I discovered roasted beets and I absolutely love them. I have converted pretty much everyone who has tried them, even the massive skeptics. Beets are also delicious hidden in baked goods, you can make a beet cake that is simply delicious. The flip side is also true. The foods that I loved in my 20's I really don't enjoy in my 30's. I used to love breakfast pastries, now I either can't have them or simply don't like sweets that early in the morning. There are still a few foods that have held on for the long haul, mostly peanut butter and popcorn. They are still the comfort foods that I turn to. However, this weekend I will be buying dark roast coffee, the flavored coffee is just not going to be a part of my late 30's. Apparently my food tastes have outgrown the need for sweet coffee in the morning. My youngest is in a massive growth spurt. He has been eating everything in sight, especially strawberries and blueberries. When we where at the store this last weekend he wanted me to buy a pancake syrup with corn syrup and fake berries. Instead I agreed to make homemade berry sauce for breakfast. 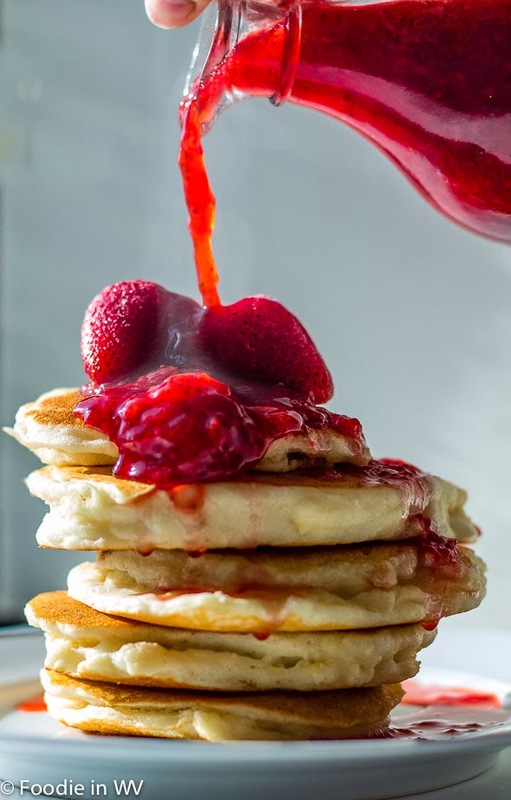 So this week I tried a new recipe for Buttermilk Pancakes from Allrecipes.com and made a homemade Strawberry Syrup. This recipe has 9 ingredients. It takes 25 minutes of total time, 15 minutes of which is active and makes 12 pancakes . I did make a few changes to the original recipe. First, I used coconut flour to replace the all-purpose flour used in the original recipe. I also replaced the butter with coconut oil. I bought a huge container of coconut oil and I have been trying to use it in recipes since I already have it in the cupboard. I found that the pancakes browned a little quickly on my griddle, so you might want to set the heat on a lower setting. Finally, I added 1 1/2 tsp of pure vanilla extract before adding the waffle iron. 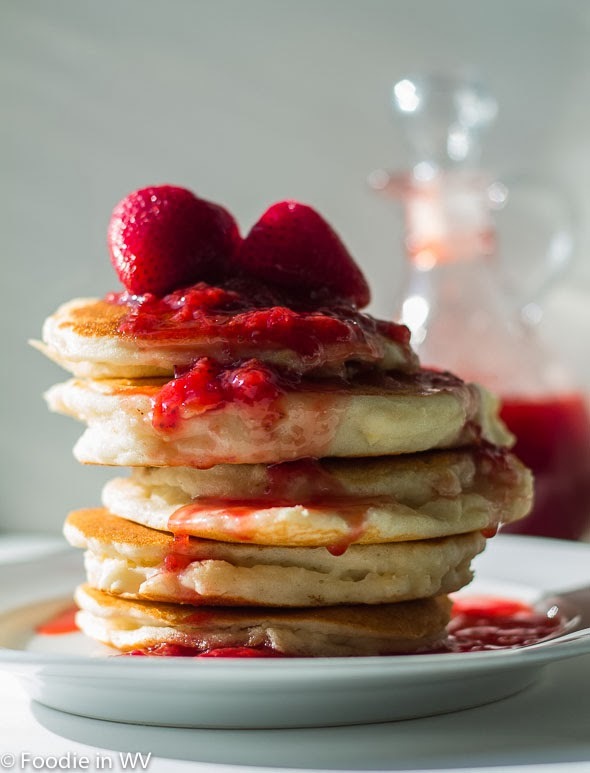 I love adding vanilla or almond extract to pancakes and waffles, they provide a great taste. These pancakes turned out really well. They were sweet, without being overly so and rose nicely for gluten free pancakes. My youngest was a huge fan of the homemade strawberry syrup I made. It was easy, just 1 cup of sugar, 2 cups of frozen strawberries and 1 cup of water. I allowed the mixture to cook until thickened and then added a small amount of cornstarch to make it a little thicker. It was great on the waffles and would also be delicious in Greek yogurt for breakfast. If you aren't a fan of traditional sugar coconut or date sugar or sugar substitute should also work. For the recipe go to Buttermilk Pancakes. These pancakes look divine, Ann. So fluffy and soft and strawberries topping is just irresistible! Thanks :) They turned out great and the strawberry syrup was delicious in yogurt the next day! I saw the first photo and my mouth couldn't stop watering. I HAVE to try this! Whenever we go to IHop for breakfast I always get the strawberry syrup for my pancakes if I get it so it's nice to know I can make my own. As for growth spurts, my 13yr old has been eating everything in sight as well. I can't wait for it to be over so I can get some food for myself. Hahahaha - I love flavored coffee. I especially love those flavor shots they have at Dunkin Donuts. Yum. I can't wait to try this recipe. I've been trying to find a good pancake recipe that uses coconut flour. These look fluffy and yummy. I love coconut flour, it's my favorite gluten free flour since it works so well in baked goods. These pancakes turned out perfect! Oh my this looks like this will be a big hit here. It was a big hit in my house! I have changed my tastes in clothes and music a lot over the years as well :) It's funny how things that seemed so important completely change as you get older! Definitely want to try these. Have you used date sugar very much? I tried it in my coffee, because I was really trying to get away from using artificial sweeteners, but it was awful because it didn't dissolve. I've used it once in baking and it wasn't too bad but I have a ton of it that I haven't used since… just wondering if you've had success with it much? I have used both date and coconut sugar. Date sugar works well in baked goods. For granola bars and cookies I often grind up fresh dates in my food processor with a bit of water. It works just as well as date sugar and adds a little more potassium etc. I try to stay away from artificial sweeteners also, especially in baking I prefer using natural sugars. Plus I think it tastes better. Awesome!! So so so good!! Thanks, they were a great way to start the day!